States are doing a better job in letting the public know how much tax revenue is being lost through special credits, deductions, and exemptions, according to a new report on tax expenditure budgets released by the Center on Budget and Policy Priorities (CBPP). Over the last two years, CBPP notes, two more states--New Jersey and Georgia--passed legislation requiring tax expenditure reviews, decreasing the number of states that do not report on the issue to seven (Alabama, Alaska, Indiana, Nevada, New Mexico, South Dakota, and Wyoming). At the same time, the Center finds, states such as Minnesota, North Carolina, Oregon, Rhode Island, and Vermont as well as Washington, DC have improved the quality of their reporting. The news is not all positive. CBPP points out that the tax expenditure budgets of 18 states are still deficient. 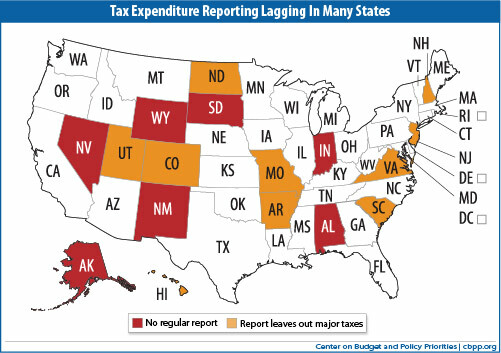 Out of 44 states that have some kind of reporting system (counting Washington, DC as a state), ten do not report on major categories of tax spending and six do not release reports at least every other year. Two states, Arkansas and New Hampshire, don’t bother to put their reports online. CBPP offers a good list of best practices for tax expenditure budgets. These include putting the reports online; including all tax expenditures, even small ones or those that affect few taxpayers; describing the types of taxpayers that benefit from each tax expenditure; and explaining the purpose of the various categories. The CBPP report comes at a time when the issue of tax expenditures is receiving growing attention at both the federal and state levels. The first step in addressing the issue is knowing how much these practices really cost, and that makes the need for thorough tax expenditure budgets all the more urgent.